Homemade ketchup seems somehow mysterious, but once you find a good recipe, it's not complicated to make. My youngest loves ketchup, so I tried out several homemade ketchup recipes until we found some he liked. The first ketchup recipe uses fresh tomatoes, and is suitable for canning or freezing for long term storage. The second ketchup recipe is lacto-fermented, so you get some probiotics with your burger and fries. It starts with tomato paste, so it's a cinch to whip up. The key ingredient to this homemade ketchup recipe is patience. To get a nice, thick ketchup from fresh tomatoes without adding any thickeners, you need to cook it down slowly. Early on, you can keep the heat a little higher and simply stir frequently, but as the sauce gets thicker, you need to keep the heat lower, as it will be more prone to scorching and bubbling all over the place. Because I save my paste tomatoes for salsa, I usually use juicier tomatoes for this recipe and more of them. Paste tomatoes will cut cooking time and you can use less of them. 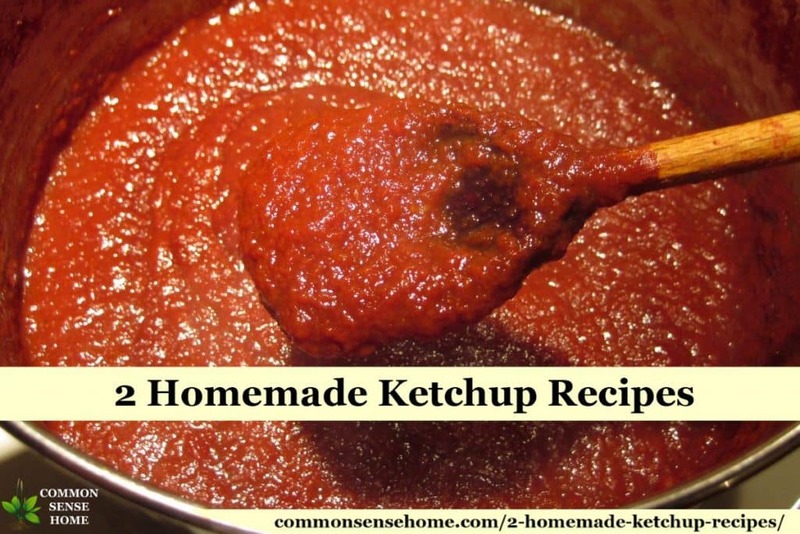 The taste of this homemade ketchup recipe is similar to a popular national brand – no big range of added spices – but like most home processed products, the flavor is richer and deeper. You can really taste the fresh tomatoes, onions and garlic. Because there is added vinegar, this ketchup is safe to can in a water bath canner. Core and quarter tomatoes and place them in a heavy bottom pot (or pots) or slow cooker on low/medium heat, stirring frequently. Cook until soft and run through a food strainer, food mill or chinois to remove seeds and skins, or cook down until volume is roughly half of original volume and then run through food strainer, food mill or chinois. As I mentioned, I usually make this while working on other things, so I do my straining when time allows. Continue cooking tomato puree until volume is roughly 1/4 of original volume. Add remaining ingredients, cook until onion and garlic are soft. Puree with hand blender or food strainer, or leave lumpy – your choice. Cook on low until desired consistency is reached. While the homemade ketchup recipe is cooking down, prepare your canner, jars and lids. The water bath canner should be filled enough to cover your jars with two inches of water. Jars should be sterilized and kept hot. I run mine through the dishwasher. Some people heat them in their canning water or in a warm oven. Process for 15 minutes in a water bath canner. Turn off heat, remove canner lid, let sit five minutes. Remove from canner and place on kitchen towel on counter top. After jars are cool, check seals. Refrigerate jars (if any) that did not seal and use them first. Makes around 9 cups for me when I cook it to the thickness we like. Easy homemade ketchup recipe, slow cooked with fresh tomatoes, garlic and onions. Core and quarter tomatoes and place them in a heavy bottom pot (or pots) or slow cooker on low/medium heat, stirring frequently. Cook until soft and run through a food strainer, food mill or chinois to remove seeds and skins. Return puree to pot and continue cooking tomato puree until volume is roughly 1/4 of original volume. Add remaining ingredients, cook until onion and garlic are soft. Puree with hand blender or food strainer, or leave lumpy – your choice. Cook on low until desired consistency is reached. While the homemade ketchup is cooking down, prepare your canner, jars and lids. Water bath canner should be filled enough to cover your jars with two inches of water. Jars should be sterilized and kept hot. Ladle ketchup into prepared jars, leaving 1/4 inch headspace. Wipe jar rims and threads. Cover with two piece lids. Screw bands until finger tight. Process for 15 minutes in a water bath canner. Turn off heat, remove canner lid, let sit five minutes. Remove from canner and place on kitchen towel on counter top. After jars are cool, check seals. Refrigerate jars (if any) that did not seal and use them first. 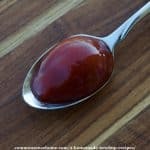 If you'd like a smaller, quicker recipe that also packs a probiotic punch, check out this easy lacto-fermented homemade ketchup recipe from Traditional Cooking School by GNOWFGLINS. Wardee said she kept an unopened jar in the back of her fridge for 6 months. An opened container would have a shorter shelf life. If you use water instead of whey, double the salt or use a non-whey culture (not both). The whey referred to in the recipe would be obtained by straining live culture yogurt or milk kefir. If you don't have whey, you can substitute sauerkraut juice from live kraut or other cultured vegetable juice, or kombucha. This will change the flavor, so feel free to experiment and see which flavor you like best. Recipe reprinted with permission from Traditional Cooking School by GNOWFGLINS. Simple fermented homemade ketchup recipe for a probiotic punch. In a medium sized bowl, whisk together all ingredients. Pour sauce into a storage container (such as a pint mason jar). Cover and leave at room temperature for two days. Move to the refrigerator for longer storage. 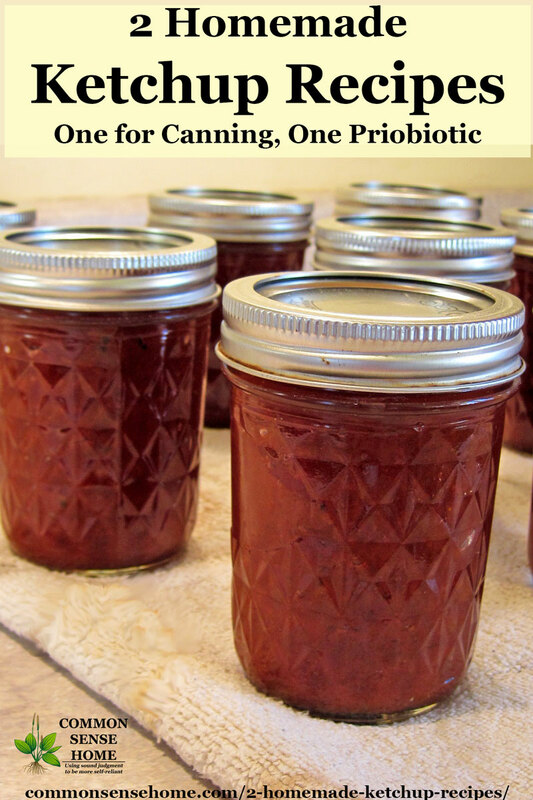 Why Make Probiotic Homemade Ketchup? Did you know that our gut is often referred to as “our second brain”, and is a major part of our immune systems? Instead of popping a probiotic pill, how about incorporating live culture (probiotic) foods into what we eat every day? As you can see from the recipe above, it doesn't have to be complicated. In her book The Complete Idiot's Guide to Fermenting Foods and her e-books and e-courses, Wardeh and the Traditional Cooking School crew make fermenting easy and delicious. I have yet to try a recipe of hers and have it taste nasty – honest! She's my go-to person when I have questions about this sort of thing. 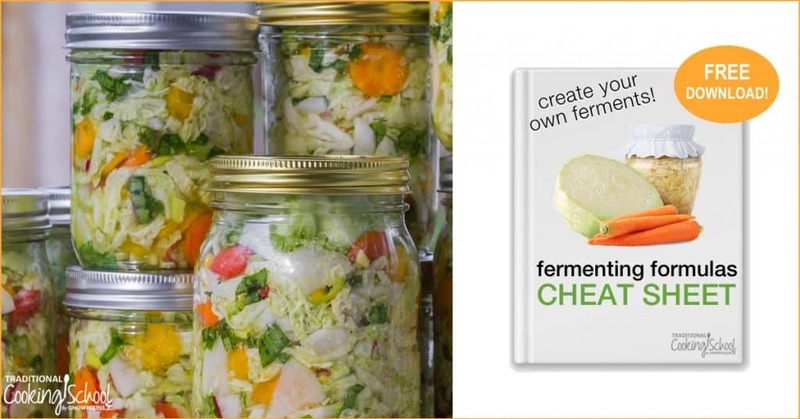 If you'd like to learn more about her Lacto-Fermentation E-book, click here or on the image below. If you purchase through my site, I receive a commission and you get a great product from people I trust. Thank you! Thank you for visiting, and don't forget to Pin and Share. 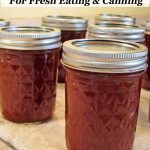 For those who are new to canning (or would like a refresher) check out, “How to Can Food at Home – Quick Guide to Safe Home Canning“. Originally published September 2013, updated in 2016, 2018. Thank you for this recipe. I love ketchup but would prefer to make my own so I know exactly what’s in it. I find this to be a good use for end of season tomatoes that may be a little more bland because of cooler temps, too. The low, slow cooking bumps up and concentrates the flavor. Thank you for the ketchup recipe. I tried it yesterday but I can’t get it to taste quite right… it still tastes very “tomato-ey” and not very “ketchup-ey”. Do you have any suggestions? Hmmm…did you do a low, slow simmer and cook it way down? The slow cooking changes the flavor profile of the tomatoes, giving them deeper notes and less “fresh tomato” action. You might also try adding some onion powder, garlic powder and even a little bit of dry mustard. A few teaspoons of dry spices won’t have much effect on pH. It’s hard to diagnose long distance – everyone has a different palette. Approx how long does it take to cook down on low in the slow cooker? I’d like to set it while I’m at work do you have to stir using the slow cooker method? Can’t wait to try this! I haven’t tried it in a slow cooker, only on the stove top, so I’m not sure. Plus, “Low” on different slow cookers will give different temps, so it’s really hard to predict an exact time. I’d be hesitant to leave it completely unattended – even a once an hour stir just to keep it from cooking to the bottom of the container would be helpful. Actually, I contacted the manufacturer about temps on “slow cookers” . Both low and high temps arrive at EXACTLY THE SAME TEMPERATURE! they just take longer to get there. I forget the exact temperature they are set at, but it is somewhere around *265-*285-ish? If you really need to know, contact the manufacturer of your brand of crock pot, slow cooker, etc to find out. While that may be true in many cases, it varies by slow cooker brand. There are some examples here: What are the cooking temperatures of your slow cooker? Why does your lacto fermented ketchup have vinegar in it? Typically I’ve seen lacto- or other fermentation as an alternative to using vinegar, so I’m surprised to see the two combined. Is it necessary for flavor, or are you relying on the vinegar for extra preservative qualities? Doesn’t vinegar kill the lacto bacteria? Given the small proportion of the vinegar, it shouldn’t kill off the beneficial bacteria and has likely been added for flavor. It will also ensure an acidic environment to improve shelf life. Hi I would like to make your homemade ketchup and was wondering if instead of using the apple cider vinegar can rice vinegar be used. I have a son with food allergies and can not use the apple cider vinegar. If not the rice vinegar is there something else you recommend to use. As long as the acidity level is the same, it’s fine to substitute for canning, although of course the flavor will be a bit different. Have you ever cooked your tomatoes, skin core and all just cut into quarters. Then put them in a pillow case that is placed in your kitchen sink. Carefully lift the pillow case, you will see the water drain out. Do this for about 15 minutes you will notice less water coming out. Then run your tomatoes through your sieve, prepare your recipe. Cuts down your cooking time like you would not believe! Of course your pillow case will forever be your tomato pillow case after doing this. I have, but usually I prep ketchup on days when I plan to be doing other things in the kitchen, so the timing is less important. I was looking for spaghetti sauce made with sweet potatoes no sugar which has a lwo glyceimic count. I used to have one but I’ve bee unable to find it this last canning season. But they don’t provide canning instructions, and it starts with canned product. How long will the ketchup in the first recipe last on the shelf (before its opened)? Thanks! We’ve eaten some that is 3 years old and it was fine. Would this still work if I just juiced my tomatoes first? I don’t think it would work quite as well, because the slow cooking of the skins and seeds helps to draw out all the tomato goodness, creating a thicker, richer sauce. Thank you for these recipes. 🙂 I’m just starting to work with canning my tomatoes for sauce or ketchup, but I’m wondering (and this may be a very amateur question…), can I just cook the tomatoes down and then add the other ingredients and then put it all in a powerful blender? Thanks in advance for your response. Some people do use a high powered blender to make tomato based sauces (rather than straining). I tried it once, and found that for my palate the flavor of the pureed seeds came out in the finished product as very strongly bitter. It was so bad that I composted the sauce. That said, some people rave about it. Everyone has a different sense of taste. If you want to go the high powered blender route, it should not affect canning safety. I would simply recommend trying a small batch first to see if you like the flavor or not before you commit to a larger batch. You’re welcome. It’s amazing how much water cooks off, especially if the season has been rainy. 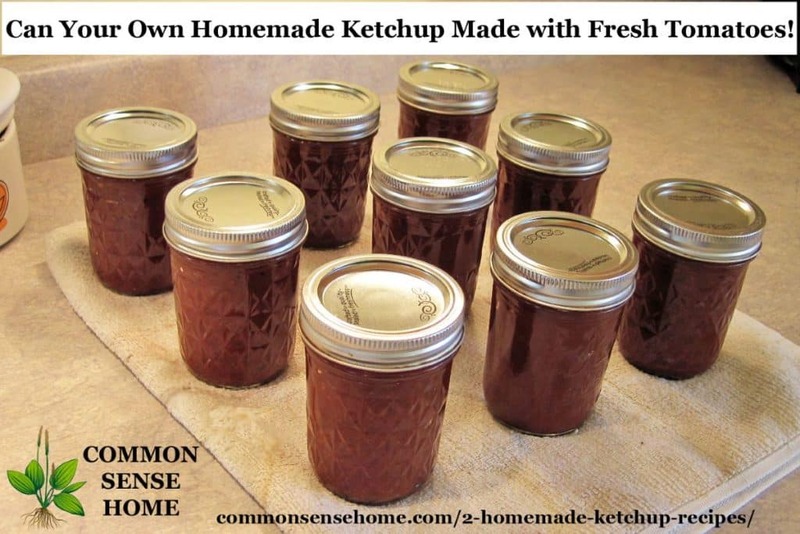 Great Information – been trying to get hubby off manufactured Ketchup for years….hopefully this will do it !! We tried several recipes, and these are the ones my guys liked the best. Definitely want to try the first recipe! How long does it last after opening? I’m guessing refrigirating it should help. It should easily keep in the refrigerator for a month, maybe more. I use Bragg’s all the time. We like the flavor.